The preceding text which dates from the opening of the website must be accompanied now by a comment, after more than three years of observation of the visiting. The “attacks” whose sites are the object are so numerous and so varied in their successive forms that the statistics relating to visitors and visits aren't reliable. In spite of the exerted monitoring and the regular “banishment” of many suspect visitors, it is impossible to draw up a completely tight stopping. Spy robots try to introduce undesirable contents or to copy the e-mails and by doing they distort the statistics completely. One will check it by looking at the curves of frequentation, which regularly go up to the sky before an operation of cleaning restores more plausible results. These disturbances and other reasons led to interrupt the statement of the statistics during several months. Since July 2009, one succeeded to drop strongly the number of US resident spy robots. But since, the spy robots from Eastern European countries, in particular Russia, took over, obliging to continue the work of cleaning. Finaly, over long period, only the number of downloaded texts appears to be a serious indicator of the interest of the visitors, even if it is incontestably very restrictive. Between 2006 and 2018, 542.966 copies of texts were downloaded, so 41767 by average year. 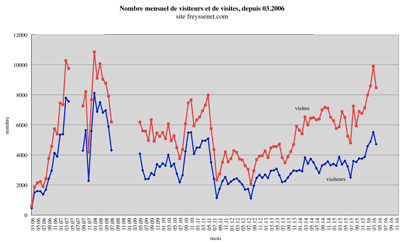 The relative age of the site in early 2012 helped to add annual statistics to the monthly statistics. What we have said above is true in a new table that gives the numbers of downloaded texts per opened page and visitor. These number grew gradually as pirates visitors have been evicted. Annual average number of downloaded texts per opened page rose from 0.05 in 2006 to 0,10 in 2018 (after a peak: 0.39 in 2012). The same number per visitor went from 0.33 to 0,67 in 2018 ( after a peak: 2.33 in 2012).